(Edinburgh University Press, 2016) xi + 228 pp. Reviewed by Dean de la Motte on 2018-01-22. Ambition can yield greatness and, on occasion, chaos and even disaster. As Michelle Coghlan points out frequently in this book, the uprising and brutal suppression of the communist revolution known as the Paris Commune of 1871 failed--or at the very least is often perceived as having failed--at least in part because of its lack of internal coherence and organization. (One might also argue that it was doomed from the beginning, given the sheer numbers of bourgeois in the large cities of France and reactionary paysans in its countryside). The same observation about ambition might be made of Coghlan's own work, the first to appear in the Edinburgh Critical Studies in Atlantic Literatures and Cultures. Fortunately, however, this excellent volume has numerous moments of greatness (i.e., brilliance), while it is chaotic (i.e., incoherent) only on the rarest of occasions. Coghlan argues for "approaching cultural memory as a phenomenon within and beyond the nation and, in turn, rethinking various media--in particular, the newspaper, the panorama, and the novel--as crucial sites for the construction not simply of national but also of international [...] memory." The subject of Coghlan's book, she continues, is the "tenacity of the Commune's second life" (4) in American memory--both on the radical left and in mainstream culture. Its legacy ranged from newspaper and magazine reports in the days immediately following the Commune to pamphlets, pulp fiction, and horror in the 1930s. It was sustained by a vast array of cultural artifacts, including but hardly limited to the panoramas exhibited at the Centennial Exposition of 1876 in Philadelphia, women's poetry, the novels of Henry James, adventure fiction of the 1890s, and the annual commemorative "Commune Festivals" held well into the twentieth century. The book's five main chapters highlight the following topics: the influence of the Commune on representations of gender in the United States, both in images and in fin-de-siècle poetry ("Framing the Pétroleuse"); the Commune as a site for the affirmation of right-wing or "mainstream" American exceptionalism, in which the American revolution is seen as a singular, never-to-be repeated event ("Becoming Americans in Paris"); the Commune as inspiration and, at times, pure nostalgia in radical leftist politics in the United States ("Radical Calendars"); the presence--or, more accurately, the absence--of the Commune in the writings of Henry James ("Tasting Space"); and, finally, the persistence of the Commune in proletarian pamphlets and novels of the 1930s as well as in the pulp fiction of that era ("Restaging Horror"). In her Introduction and Epilogue, however, Coghlan situates the body of her work in the context of more recent, even contemporary instances of resistance and rebellion such as the student protests of the 1960s, Occupy Wall Street, and Black Lives Matter. To simplify or summarize her work, I would say that she foregrounds the various reactions of Americans and American institutions: how they perceived (or repressed) the fall of the Second Empire, the uprising of the Paris Commune and above all its brutal suppression by the Versailles government of the incipient Third Republic in the bloody week of 21-28 May 1871. In other words, Coghlan aims to show how representations of the Commune were variously used, redeployed, or repressed in the years from 1871 to 1939. Ignoring, for instance, the ruthless violence of the Versailles army during la semaine sanglante, the American press deplored the Commune's destruction of the architectural gems that American tourists had been so fond of visiting during the Second Empire. Commentary on the Commune was also inflected with questions of class, gender, and politics unique to a post-bellum, progressive America in the gilded-age; or conversely, as the author puts it, "the specter of the Commune took up residence in the US, haunting and electrifying even those writers and readers who never left home" (5). Much of the interdisciplinary richness of Coghlan's study, however, emerges from her detailed analyses of visual representation and spectacle--not just the "panoramas" and "cycloramas" examined in her introduction, but also the "visual culture of gender panic" (the subtitle of Chapter 1), as well as the festivals, speeches, balls, and concerts commemorating the Commune. 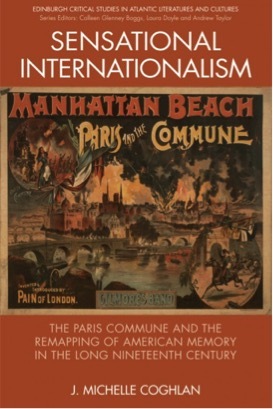 Chapter 3, for instance, opens by recalling the 1891 Coney Island pyrotechnic spectacle, "Paris, from Empire to Commune," which was advertised by a poster that graces the cover of this book. Attended by over 10,000, it featured some 300 actors, acrobats, and circus performers. Coghlan is at her best when she surveys the impressive archive she has assembled and seeks to answer, in ways far more subtle than can be summarized here, the big questions that arise from it. How were representations of the women of the Commune used to (re)enforce gender norms in late nineteenth-century America (chapter 1)? How did British and American adventure fiction for boys reinforce dominant ideological paradigms already current in the United States of the 1890s (chapter 2)? How did memories and refigurations of the Commune of 1871 inform both the radical left and its mainstream critics in the gilded age and beyond (chapter 3)? What role does the presence (or absence) of the Commune play in the "Parisian" writings of Henry James (chapter 4)? And finally, how did 1871 continue, with the dogged persistence of a revenant, zombie, or vampire, to shape both leftist propaganda and pulp fiction, including horror novels like Guy Endore's enigmatic The Werewolf of Paris, well into the 1930s (chapter 5)? While this observation seems undeniably true, it does not significantly enhance the book's effectiveness, for one might argue that all representation of historical events is subject to such cyclical, multilayered remembering, manipulation, and distortion. To privilege revolution would thus seem a political gesture in itself, which leads to another problem. On the one hand, in her introduction and epilogue, Coghlan overtly links her "remapping" of American memory to the politics of the present moment, thus implying that her own book, perhaps, participates in a revolutionary project. On the other hand, she aims not only to remap the memories of the radical left but also to show how the dominant culture "saw red," as in her enlightening discussion of Lucy Parsons and Voltairine de Cleyre (92-104). Still, her sympathies lie unswervingly with the dead of the Commune. While her accounts of the radical left tend to highlight, at worst, the nostalgic and the utopian, and at best the visionary and the heroic, she defines the dominant or reactionary culture in the United States in terms of fear. Whether comparing American feminists to pétroleuses (female petroleum-throwers) or communards to "red savages," she argues, this culture recycled the Commune with fear, paranoia, distortion, and manipulation. There is nothing wrong with this approach, of course; it is both historically and textually grounded, and it gives to Coghlan's account much of its engaging passion--a passion at times bordering on zeal. I simply wish that she had stated more clearly her parti pris. Like many ambitious projects, this book has its flaws. First, in giving scant attention to the history of the Commune itself, it assumes knowledge not only of the events of 1871, but also of prevailing attitudes toward them, both in France and the United States. Even in the age of Wikipedia, all but the most specialized readers would have welcomed at least a few paragraphs situating the Commune within nineteenth-century history as well as an unabashedly clear overview of the book's overarching perspective and purposes. Second, the book draws on very few French sources. While Coghlan clearly aims to review American memory of the Commune in the long nineteenth century, and while she reminds us that the Commune had been viewed from the start as an international, "radically non-national event" (88), she pays no heed to French memories of it. Among the manuscript and archive collections consulted, for example, only one is French, and no French periodicals appear in the otherwise impressive array of newspapers and magazines listed in Coghlan's bibliography. If French memories of the Commune had been compared with American versions of the event (on both the left and the right), the latter would likely have appeared even more "sensational" and specific to the United States. In drawing almost exclusively on American sources, therefore, Coghlan seems to ignore the stated purpose of the Edinburgh Series, which this volume inaugurates. According to the Series Editors' Preface, "Modern global culture makes it clear that literary study can no longer operate on nation-based or exceptionalist models." Similarly, more French context would have enriched the chapter on Henry James. Since James knew Zola, Maupassant, and Daudet, what did they think of the Commune, and how might their views have strengthened Coghlan's arguments about the specificity of American refigurings of the bloody events of 1871? While she quotes Peter Brooks's Henry James Goes to Paris, she might also have consulted his Flaubert in the Ruins of Paris, which reads that annus horribilis largely in light of Flaubert's correspondence with George Sand and his own recently-completed novel of (the 1848) revolution, L'éducation sentimentale (1869): it was published just as the "Internationalist" success in the May elections of that same year began to bring down the Second Empire. Coghlan likewise overlooks Baudelaire's influence on Pound. Though she quotes Pound's modernist injunction to "make it new" (132), she does not mention that it famously echoes Baudelaire's conclusion to "Le Voyage" (in Les Fleurs du mal, 1857), where the poet proclaims, "Heaven or Hell, does it matter? To the depths of the Unknown to find something new!" Some notice of Baudelaire's turn from political engagement and toward aestheticism after that other revolution (again, 1848) might have provided helpful perspective on James's protomodernism. In short, the author might have thrown an even more dramatic, spectacular light on American representations of the Paris Commune if she had briefly projected them against the historical record of its events and even, perhaps, against the ways in which these events were simultaneously being described and reimagined in France itself. Given this point, one might argue that the chapter on James could have been eliminated entirely without doing any serious harm to what is best in Coghlan's book; at the very least, the chapter might have been enriched with some French material, as suggested above, and moved up in the book, perhaps between chapters 1 and 2. Finally, one superficial matter bears mentioning. The book's subtitle, The Paris Commune and the Remapping of American Memory in the Long Nineteenth Century, might be misleading to some potential readers. As defined by Hobsbawm, the "long nineteenth century" nearly always denotes the period 1789 to 1914, but this book treats the years from 1871 to 1939, with important references to both the 1960s and the present day in the Introduction and Epilogue. Nevertheless, the naming or mis-naming of periods is a relatively minor matter, and the author's almost exclusive focus on American sources may trouble others less than reviewers like me--a comparatist working primarily in nineteenth-century French studies. Michelle Coghlan's thoroughly researched and beautifully written study will greatly interest specialists in late nineteenth- and early twentieth-century American literature and culture. It should also be required reading for those who study the intersection(s) of literature, mass culture, politics, class, and gender, as well as for those who study Franco-American relations of the same period. Indeed, our current climate of crony capitalism masked by the rhetoric of populist nationalism is the perfect setting for an inquiry into the persistence of the revolutionary, "radically non-national event" of the Paris Commune, and what competing discourses and ideologies in the United States have done with it. Dean de la Motte is Professor of French and Comparative Literature at Salve Regina University in Newport, Rhode Island (USA). Leave a comment on Dean de la Motte's review.